Bubba Carver, under jockey Francisco Calderon, gets a 107 speed index and the top qualifying mark in Saturday's Retama Park Derby(G3) trials. SELMA, TX�JULY 13, 2013�Bubba Carver rolled to impressive daylight win Saturday night to set the top qualifying mark for the Retama Park Derby(G3). The 10 fastest 3-year-olds from five trial races conducted over 400 yards will return Saturday July 27 and vie for the winner's share of a $75,000-added purse. Coming off a win in the Ben E. Keith Stakes June 22, Bubba Carver bounced to an impressive 1 � length win and the top qualifying mark in the second trial for trainer Judd Kearl. Under jockey Francisco Calderon the WAVE CARVER gelding completed the 400 yards in a quick :19.568 seconds, 107 speed index. 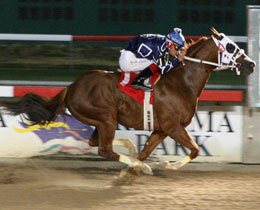 It was the fifth win in10 starts for the Texas-bred gelding owned by Douglas Traylor and bred by Bob and Jerry Gaston. A half-brother to 2012 Texas Classic Futurity(G1) winner Valiant Lil Lady, he is out of the Fredricksburg mare Rustys Lil Lady. He has earned $46,905.